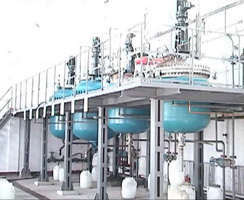 JYC GROUP(Twaiwan) LTD. set up in 1985, is chiefly engaged in the production and development of fine chemical products. It satisfies the world chemical industry with its strong technology, advanced equipment, high quality products and excellent service. At present, its products are mainly for European, American, Japanese and Southeast Asian markets. Yangzhong Jie You Chemical Co.,Ltd, wholly invested by Jyc Group(Twaiwan) Ltd. & located in the chemically developed Yangtse River Delta, owns a productive plant and a lab. Main products:Polyurethane dispersion,Fluorescent brightener, Ultraviolet light absorber,Photocure, Coating additive of powder and relevant intermediates. They are widely applied to rubber, plastics, leather, inks, textiles and dyestuff. Photocure (1173,BDK,907) Ultraviolet light absorber (UV-531,UV-P) Fluorescent brightener (127,OB,0B-1,KCB,KSN,CBS) Sticking to the motto of " Quality and Reputation First and Customers Supreme", we wish to cooperate with you sincerely for a better future by providing you with quality products, preferential price and quick and perfect service. Copy Right© YANGZHONG JIE YOU FINE CHEMICAL CO., LTD.